This last week I had the opportunity to fly out to Florida and meet with Paul and Marcia Cowley, who head up Disciple Support Ministries in Nairobi. It was a great trip out there, even though it was very short! I flew out Monday night. After trying to check in at the airport, I found out the my flight had been cancelled A MONTH AGO and was never notified. The airline was able to get me on another airline to Tampa, but it required a little juggling of the schedule, and I made it in time to meet up with Paul and Marcia. During the meeting, I was able to see just how amazing this ministry is. DSM reaches out to the pastors and ministry leaders of the churches in the slums of Kibera and Mathare. Since these men and women already lead churches, the impact is phenomenal. With approximately 150 students each semester, this ministry basically feeds 150 different churches, reaching out to thousands of Kenyans. A typical day at the school is very full. At 6:30 in the morning, students begin their day with service. typical jobs include cooking breakfast, cleaning the floors, setting up the desks, and others. At 8:00 class starts. Normally they go through a book from the Old Testament. Class runs through 12:00, when they break for lunch. At 12:45 school begins again, and for the next four hours they study a book from the New Testament. at 4:45 clean up begins, and usually lasts until 5:30.The schools each operate one day a week. The pastors are required to maintain a job outside of the church while attending school, so they are not tempted to fall into fleecing the church members. The pastors also regularly meet with DSM leaders to discuss areas of discipleship, such as family and work issues. There is only one textbook at this school: the Bible. The pastors are taught how to interpret the Bible and teach the Bible by relying on the Holy Spirit to enlighten them. Since most of these pastors would never be able to afford a commentary or book about the Bible, this truly is a blessing. It has been said that the best commentary on the Bible is the Bible, and this ministry seems to live on that motto. The amount of paperwork created by this ministry is large. 150 students created 300 homework assignments a week that need to be graded, and 300 test a month. This work, combined with the student files for the 500+ students that have gone through the school, shows just how important the gift of Administration is to DSM. DSM is constantly in need of people with administrative backgrounds. I left the meeting feeling very confident about working with DSM. At this point, we are praying for God to confirm yet again that this is where He wants us. Please join us in praying that God will confirm this to myself, Adrienne, the Cowleys, and all others involved. I am sure that most of you have heard of the ongoing violence in Kenya. It truly breaks my heart to see this country descending into chaos. When I see the suffering that is going on, I begin to wish that I was already there, so that I could minister to these people, as he hardest hit areas are the areas that we plan on ministering in: the slums. There is more to the violence than just the discrepencies in the elections. There are long-standing issues that are involved in this mess, including tribalism and extreme poverty levels. Some of these issues have roots that are very deep in the fabric of Kenyan culture and history. We could share many examples of how God is at work here in Kenya during this time of chaos and violence after our recent elections, but I'll keep it to what happened yesterday afternoon. After Sunday morning's service at Calvary International Fellowship we had learned one of our regular attendees was housing people that had lost their home from post-election violence. Another family knew of many others that were without food in their house because of the riots and wanted to know how to get some food to them. Sunday afternoons are usually taken up with a meeting for CIF leaders followed by our Sunday afternoon Bible study, but we knew it was time to put James 1:22 into action as we became doers of God's word and not only hearers. Our little Toyota's suspension creaked as we loaded Lucas, a Kikuyu, Daniel, a Kamba and Lillian a Luo with myself with the lentils, cooking fat, unga, beans and tea leaves in it. CIF's multi-nation, multi-tribe, multi-tongue leadership team bounced down the dirt paths to Stephen's home where we found him housing more than 12 people under his roof. One man had deep gashes from being beaten by another tribe as he walked home and was afraid to return and was staying with the group for safety. A family of children sat on Stephen's couch not knowing what their future held because they had not heard from their parents since the election. We all felt good to know God had supplied for Stephen to feed these people. Lillian is on of he students from Disciple Support Ministries Bible Institute in Mathare and the only person from that area to make it to CIF this week. She serves within the church and was along with us to help pass out the food. We welcomed her as a great prayer warrior. As we heard the stories in Stephen's house Lillian began sharing about her experiences in Mathare Valley since the election. We all knew Mathare was one of the worst places of violence and wanted to hear more. Everyone in the room had experienced horrible things in the last week, but Lillian stopped us all when she said, "We had some little food, but we could not take it because they were killing people outside our door." Lillian went on to explain how they had stayed for days inside their house to fearful to go outside. Even after the ran out of food they stayed inside. God preserved her two wonderful children and her husband, but that there was death all around. Many of her neighbors lost everything and are afraid to leave for fear of being killed or looted. Praise God we could send her back with enough food for her family and neighbors. Ed and Kelli Compean have spend the next few month's ministry budget purchasing food for the members of their church. If you would like to donate to their ministry, please visit Shepherd Staff's web page. Please continue to lift up this nation to the Lord. Please pray for the missionaries on the ground, as well as those that are back in the states right now. Pray that peace would come to this nation, both political peace, and the true peace that only comes from the King of Kings. As you may or may not have heard, there has been much political turmoil in Kenya. As a result, many, many families have been displaced from their homes and although the death toll reports differ from various sources, we know that the social situation needs a lot of prayer. There is also a scarcity of food and water among the people. There are many rioters and looters that have made the situation dangerous for the Kenyan people. Most of the missionary families we are in contact with are in the states on furlough. Please pray for the people of Kenya as well as the mission field in the area. 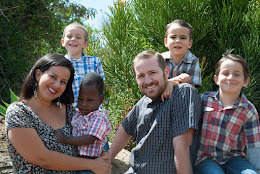 Our missionaries from Kenya will be coming home to people who are in a tough time. Also, please pray for DSM. The pastors that attend the Bible College have been in some danger. Quoting from an email I received from Ed Compean, "We are worried about the pastors from DSM. We can’t get to them and probably will not be able to for several days. We know some of them have lost everything." We thank you so much for standing with us in prayer.